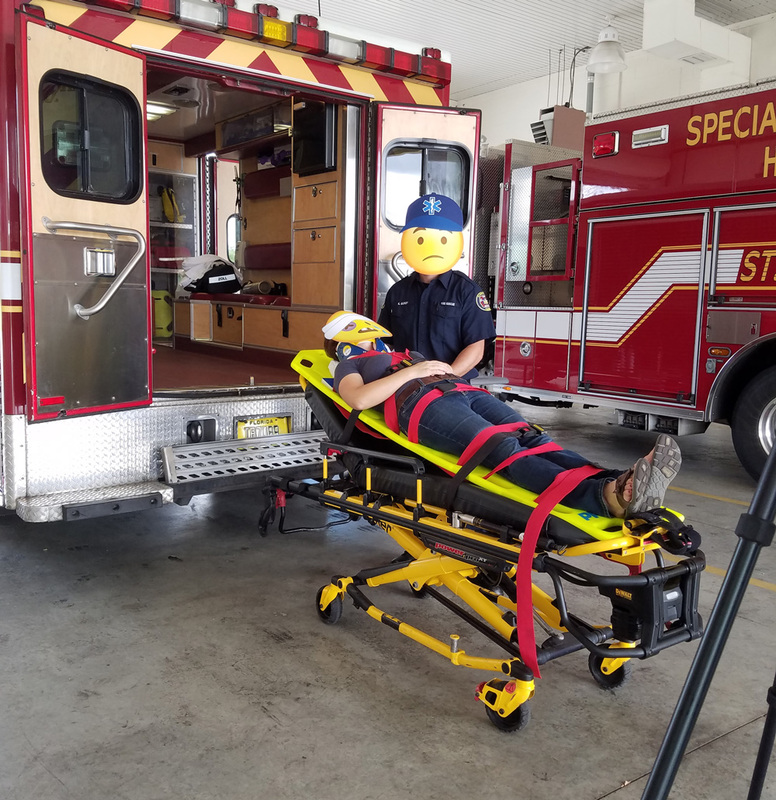 Northeast Florida’s Community Traffic Safety Team introduces their new Distracted Driving Safety Campaign with the help of a few emoji friends…Some initial reactions range from big smiles to all out laughing, to surprise and serious chill bumps. Distracted driving is no laughing matter. While this is a more unique and light-hearted approach to remind everyone not to text and drive, it has a grave message. Pay attention when you’re behind the wheel. Don’t forget to always wear your seat belt. It isn’t just a good idea, IT”S THE LAW. In addition to the distracted driving emoji PSA safety video, a tag-a-long flyer was created. But it’s not just an ordinary handout that gets tossed out. The safety card is also a sticker sheet. 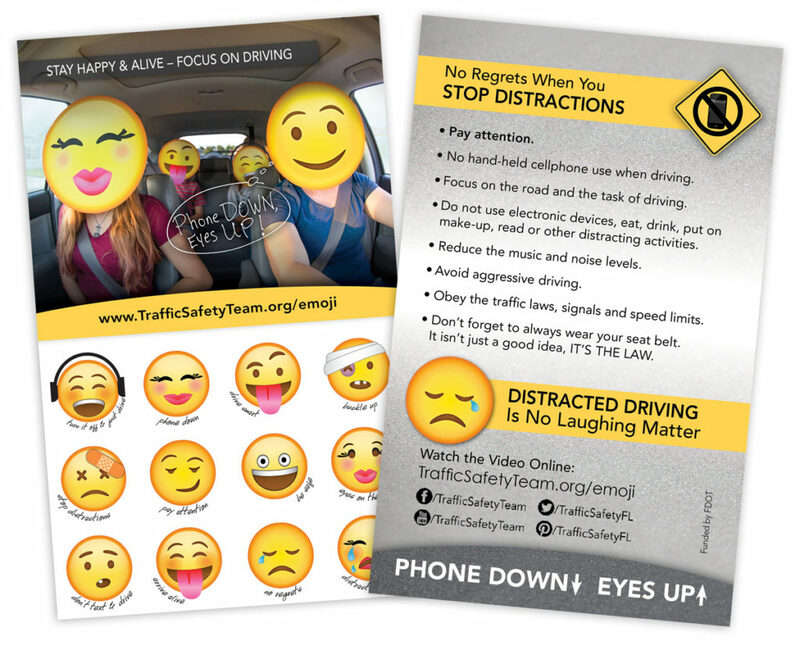 So just peel off your favorite emoji face, happy or sad, and get a cool sticker with an important safety reminder. On the back are more traffic safety tips. These are great for young teen drivers and those of us that need the occasional reminder stop texting while driving. This includes checking emails, social media, stocks, news, games and other apps. Phone Down, Eyes Up! Buckle Up!! Even though distracted driving is not a laughing matter, we did have a lot fun making this commercial. Creating the concept, illustrating the emoji faces and making the emoji masks brought lots of smiles and very little blood, sweat or tears. Shooting the video brought a whole new set of challenges, but it’s totally worth our efforts if we save just one life. And hopefully make a difference in how we all drive. 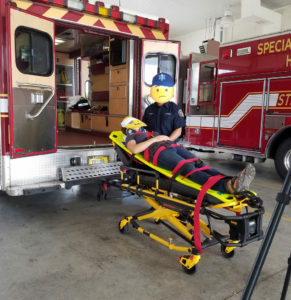 First responders, FHP, local police and emergency personal deserve a big thank for all they do at the scene of a car crash when accidents happen. Special appreciation goes out to our local St Johns County Fire Rescue and crew at the Murabella Fire Station 16. Their insight, knowledge and willingness to help was amazing. Visit our Distracted Driving safety page for more tips and distracted driving crash facts.